Few places enchant the senses quite like Villa Violeta. Luxury-Seclusion-Adventure-Rejuvenation. Our private boutique villa sits atop a granite recess with stunning views of the northwestern coastline on the Pacific Ocean. It is nestled amongst twenty-five private acres of soaring palms and boasts over 350 feet of beachfront on just under 1 acre of land. 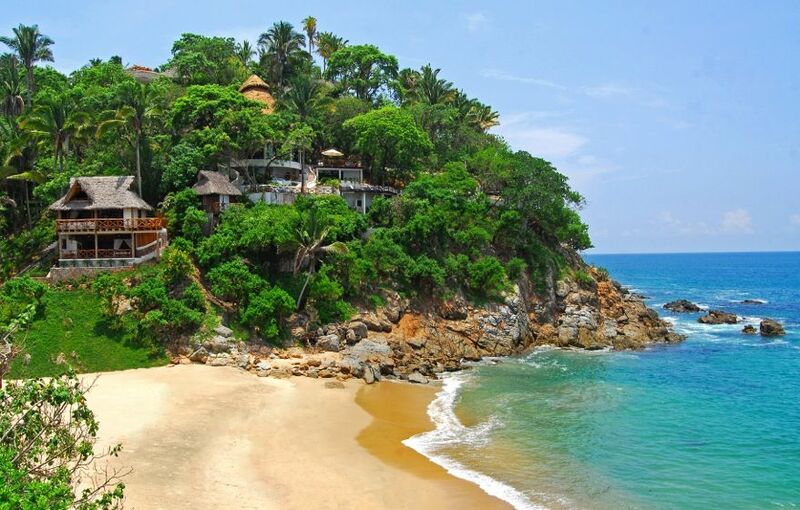 We offer luxury resort style services including the use of a talented chef who prepares and serves 3 meals a day, daily housekeeping, adventure and water activities and multiple spa services By car or taxi, Villa Violeta is only 45 minutes from the airport in Puerto Vallarta and 20 minutes from the popular town of Sayulita. It is the perfect destination for those who seek seclusion, privacy, tranquility, and luxury, and yet is located just 45 minutes north of Puerto Vallarta with its international airport, world-class dining, great shopping and nightlife. It is 2 miles from the quaint, unspoiled village of San Francisco (San Pancho to locals), 20 minutes from the bustling fishing and surfing village of Sayulita, and a short drive to the Four Seasons Resort at Punta de Mita. The palapa roof of the main house soars to over 60 feet creating a dramatic backdrop for this unique home. There is a whisper of Indonesian style in the decor and dramatic touches of India in the architectural details. The 40 foot living room is open wide to take advantage of the soft Pacific breezes and coastline views, while milky, marble floors cool your bare feet. Ancient carved Indian arches frame the media room, with its comfortable seating area, air-conditioning, satellite TV, PS3, movie projector with a pull down movie screen, a master bath with twin vanities, and a stunning outdoor shower complete the Media Room. The living area has an additional powder room at main entrance for all to use. The large, charming kitchen is fully-equipped with a microwave, toaster oven, coffeemaker, you name it...but best of all, a wonderful local cook to tend to all your needs! Just steps away is an outdoor terrace overlooking the pool, beach, and gorgeous Pacific coastline. Follow the stone steps around the house to the spacious, second-floor king Palapa Suite with baño, sink and shower. The suite features a large sleeping area with King bed and 2 twin beds & an open closet. The open-air palapa roof stretches up another 30 feet for a dramatic effect. The beds are draped in flowing white nets and have fans for a cool breeze all to give this room its own exotic/tropical personality. It's the perfect romantic hideaway. Just below the main house there is a comfortable garden/spa lounge overlooking the manicured gardens and pool. The perfect spot for a massage, afternoon siestas, reading your favorite book or just whiling away the hours in paradise. Take a few steps down from the main house to one of our 3 casitas, Casa Nido. This private, cozy casita has a king bed and private bathroom with an outdoor shower. Very romantic! Continue on a few more steps down from there and you arrive at Casa Coco, our largest Casita. The lower level has a king bed, clawfoot bathtub, and private baño all surrounded by beautifully handcrafted rock walls. The upper level has a king bed, sleeping loft area with 2 queen beds, living room area and a beautiful wrap around deck. There is a shared full outdoor bathroom with shower surrounded by a bamboo wall for the entire casita. This is perfect for 2 couples or a family! Take the steps down from the main house across the pool, across the beautiful yoga deck and you arrive at Casa Mirador. This Casita has a king bed, full private bath with indoor shower and sunken bathtub. All of the walls are glass doors that slide open to hear and feel the ocean breeze. As all of our views are spectacular, Casa Mirador has an especially stunning view! You can enjoy this view from your room or on the rooftop deck furnished with lounge chairs and an outdoor bed. You can relax all day on the sands of your secluded beach, pass the hours beside the sparkling, sapphire pool, or take a gentle ride in a hammock while overhead the palm trees dance to the ocean breezes, rustic, private steps will carry you down to the sands below. Contact us now by e-mail for more information on our area or what to expect at our villa! If the Villa Violeta dates you are interested in are reserved, please ask us about our sister property, Villa Caleta located directly across the beach. The newly renovated Villa Caleta sleeps 10 guests in 4 bedrooms plus a sleeping loft. It's every bit as luxurious as Villa Violeta and comes with a staff and similar amenities. Additional outdoor shower located near pool for rinsing off after a swim! The villa operates like a private boutique resort. The charming village of San Pancho is a short 10 minute drive from the villa. The house is located on private property, perched on the hillside just above a beautiful, secluded beach. The villa's private 18 hole Disc Golf course starts at the villa and winds through the jungle. A very unique amenity. One of a kind in Mexico. There is a view of the Villa's private 18 hole Disc Golf course that starts at the villa and winds through the jungle. A very unique amenity. Mountain/jungle views from property along with the ocean views. Full ocean views from the entire property. The house is located on private property, perched on the hillside just above the ocean. Beautiful ocean views and up the coast. A house phone is available to use in case of emergency. It is recommended that guests activate an international calling plan for their cell phones prior to arrival. Yoga Mats, dumbbells and a fitness ball are available for use on the multiple yoga decks. Multiple indoor and outdoor dining areas available. 120 inch screen surround sound projection TV. Movie Theater quality. Satellite system connects to many popular US based channels. Full Stereo system includes turntable and iPod dock and speaker system throughout property. A large library of books is found throughout the house including local travel guides. A large collections of classic board games. Includes a turntable and large vintage vinyl collection. Various beach toys are available for guest use. Large library of DVD and BluRay discs. Lush, tropical gardens throughout the property. 7 kayaks to choose from including 3 double kayaks. Local panga rentals are available with a driver that can pick you up on the beach in front of the house to take guests fishing, surfing, snorkeling, diving and whale watching for a fee. Main deck, pool deck, roof top deck on one of the casita's and a multiple yoga decks. Snorkeling and kayak gear and multiple beach games are available. There is a beautiful 9 hole golf course in San Pancho 10 minutes away. Violeta also has its own 18 hole Disc Golf Course with regulation baskets. One of the only ones in Mexico. A very unique amenity. Full-time staff including a bi-lingual concierge, private chef, housekeeper and groundskeeper. Chef services are included in the rental rate. Food costs are tracked and charged back to the guests plus a 30% administrative fee. Fully-equipped kitchen, luxury linens, 2 outdoor bars, private heated pool, private steps to the beach, 7 kayaks, snorkels/masks/fins, lifejackets, beach chairs and beach games/toys. Large book and game collections, movie projector with pull down 120" movie screen and PS3 blue ray player/large dvd/PS3 collection, record player with extensive vinyl collection, hammocks and numerous siesta zones. One of the most unique amenities at Villa Violeta is the 18 hole Disc Golf Course that was built by our contractor who is a life long disc golf enthusiast from Chico, CA who has lived in San Pancho for 25 plus years. Private, remote location on hillside just above secret beach with breathtaking ocean and jungle views. Please see sanpanchovillas.com for more info. There was a spectacular view from every unique perch on this fabulous property! We had a small group of ladies... a "girl's trip" who stayed for a very relaxing week. Some of our highlights included the amazing service of the concierge, Yesika, and the entire staff. Colorful, mouth-watering meals were served on delightfully dressed tables with freshly made margarita's, ice-cold Corona’s and aqua fresca juices with views of the secret beach, Pacific Ocean and lush jungle. Lazy days sunning by the pool on the pineapple express raft, drinks served poolside and more views. Numerous decks dotted around the property with lounge chairs... our favorite spot for our happy hour/sunset aperitif we fondly named "the sunset deck" where we enjoyed other-worldly sunsets -- pink / orange sky's, dramatic clouds and the Mexican air force of Pelicans soaring by us at eye level -- and of course, cocktails and great photo ops! There was plenty of space for us to spread out in the various different bungalows all with amazing views, nicely decorated -- some with outdoor showers/tub -- comfortable beds, soft linens, robes and toiletries as well as fresh water decanters and tropical flower arrangements. We also enjoyed a day hike through the jungle to the North for a beach visit to Playa de los Muertos and an evening out in Sayulita rubbing elbows with the interesting locals and tourists alike. A tropical holiday at Villa Violeta or its sister property across the beach are not to be missed... book it now! What a wonderful resort, staff and location!!! I was extremely impressed by the entire stay at this villa! The staff was amazing in every way! The location was perfect and spectacular views all around! Viva Puerta Vallarta! Thank you to Villa Violeta for making our stay perfect...see you again soon! Great house, with lots of privacy. This is where you go if you want privacy and care. The house fits everyone great and the staff takes care of your every need. There is nothing ostentatious about the house or the service, which is exactly what makes it excellent. Yes there are bugs. Yes you can't flush toilet paper. But, you're waking up with yoga (if you want) and being served pitchers of fresh pina colada's without even asking. I can't say enough about the incredible team that greets you. Can't wait to be back! We just returned from Spring Break after renting both of these villas, Casa Violetta and Casa Caleta. My family stayed at Casa Violetta and it far exceeded our expectations. We were four families with six kids and there was plenty of room to spare. Each room was decorated with such thought and beauty. And simple good taste! The views from every vantage point were spectacular. The main house was a perfect place for us all to hang out after dinner. There was also a big screen room where the kids enjoyed a movie a couple of nights after a day of sun. The chefs kept us incredibly well-fed and the Staff kept our rooms clean and we were able to relax with not a care in the world. The Staff was so friendly and the food was Excellent! They were very personable and and learned ALL of our names. The meals, as well as the hospitality, were full of Love. We laid on the beach and read books and played backgammon while some of us were on Kayaks, others swimming in the ocean, or in either of the two pools. The frisbee golf was a huge hit and so much fun. And my daughter fell in love with Oso, the resident frisbee-chasing dog. There was something for everyone! The sound of the ocean all day and night puts you in a constant state of relaxation. The Staff and Yessica, our AMAZING concierge, never ceased to impress us with their attention to every detail. Yessica set us up with days of excursions. Surfing, fishing, and trips to see the Blue Footed Boobies on an island where we had dolphins and whales swimming near our boats. We went into the wonderful towns of San Pancho and Sayulita with such ease. We can not express our gratitude enough to having been so lucky to have this experience with our friends. Beautiful private home. Decided to go renew our vowels. Fourteen family members joined us. All of us were comfortable and did not feel like we were on top of each other. There are so many places to go relax and break free of the family. Staff was amazing, made us feel right at home. First class from beginning to end. Chefs were great and showed us authentic Mexican cuisine. Will definitely come back. If the Villa Violeta dates you are interested in are reserved, please ask us about our sister property, Villa Caleta located directly across the beach. Newly renovated Villa Caleta sleeps 10 in 4 bedrooms and a sleeping loft. Play our private 18 hole Disc Golf Course that starts at the villa. Relax on our secluded beach. Massage, Manicure and Pedicure services, Yoga, Bird-watching, Whale and Dolphin watching, surfing, kayaking, snorkeling/diving, eco-tours, local turtle release in San Pancho….or take a siesta or two in one of our many peaceful locations tailor made for a mid day snooze.